The State Treasurer just dropped a bombshell: He reported that the State Healthcare Plan – the plan that pays for health insurance for teachers, state employees, and retired state employees – is $43 billion in the red. That’s bad news. But there’s more: The State Pension Plan – for the same workers – is $17.5 billion in the red. Combined, the two plans are $60 billion in debt. That’s called an unfunded liability. Taxpayers will have to pay. And right now, every day, both plans are piling up more debt. So the first step is to stop digging the hole. The Senate Pension Committee Chairs have proposed legislation to solve one of these two problems and start on the other. Let’s look at the proposed policy changes. Current Pension Policy: Right now, after working 28.5 years a state employee can retire and, no matter their age, immediately begin drawing a state pension. That pension is guaranteed. It’s a fixed amount. It doesn’t depend on how much was set aside over the years. Or how much the Pension Fund has earned on its investments in stocks or bonds. New Policy: Under the proposal, new state employees will be offered a 401 (k) retirement plan – the same kind of plan most major corporations offer. The employee will pay into their 401k, the state will match their payments and, when they retire at the age they choose, the total paid in plus how much the 401k has earned on its investments will determine their pension. There’s one other major change. Right now, if an employee works for the state for 20 years, the state will pay for his or her health insurance for the rest of his life – whether he continues to work for the state, goes to work for a private business, or retires early (say, at age 50). Under the new proposal, in the future, new employees will receive state health insurance benefits only during the time they work for the state. The next step deals with how to pay the Pension Fund’s debt. The entire state budget is $22 billion. So, a $17.5 billion debt cannot be paid overnight. It has to be paid over years. 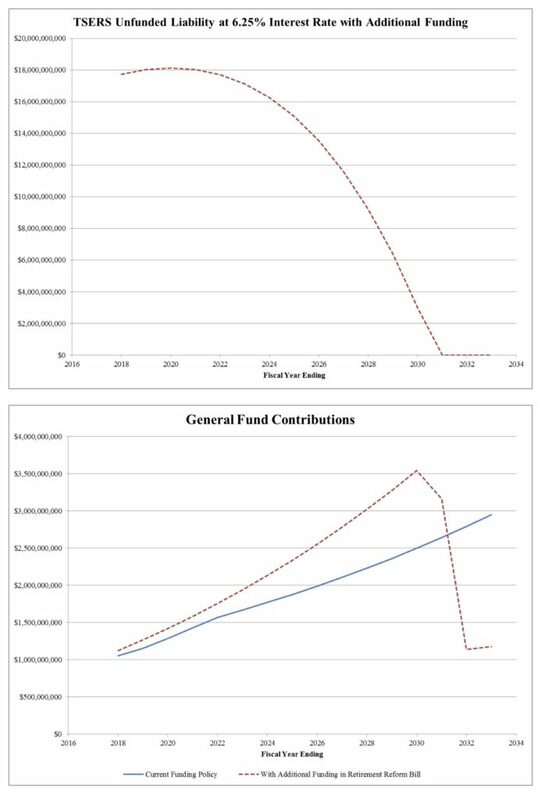 The Pension Committee’s legislation makes a $100 million payment on the Fund’s debt in the first year and begins a process that adds $100 million to that payment each following year. In other words the state will pay $100 this year, $200 million next year, $300 million the third year and, after that, each year the payment will increase by $100 million. That will completely pay the Pension Fund’s debt in 15 years. None of these changes affect current employees or retirees. Except for making sure the money is there to keep past promises about their retirement. Digging a hole is easy. But climbing out is hard. And there’s no question this is a tough proposal. But every day the Pension Fund’s debt is growing bigger. And the longer we wait to start climbing out of this hole, the tougher it will be.